Thai Airways' affiliate Nok Air and Singapore Airlines' (SIA) subsidiary Scoot should be able to build on their respective strengths as they enter Thailand’s medium/long-haul low-cost sector with the launch of NokScoot. The two companies are well positioned to establish a strong competitor to Thai AirAsia X.
Thailand will become the first country to have two carriers following the emerging long-haul LCC model, providing an intriguing dynamic and ushering in a potentially unprecedented level of competition. While NokScoot and Thai AirAsia X will likely have similar networks, some product differences could emerge as Nok Air follows more of a hybrid model compared to AirAsia, AirAsia X and Scoot. NokScoot plans to operate an initial fleet of two 777-200s sourced from SIA. The new carrier at least initially will focus on destinations in North Asia, particularly Japan. Thai AirAsia X is expected to serve some of the same routes but with more efficient A330-300s. Nok and Scoot signed on 13-Dec-2013 a non-binding memorandum of understanding to establish NokScoot as a new medium/long-haul LCC based at Bangkok Don Mueang Airport. The two carriers announced the tie-up on 16-Dec-2013, stating that Nok will own up to 51% in NokScoot and Scoot will own 49%. Fleet, product or network details were not provided. A project team is still working on the details, which are expected to be finalised by Feb-2014. At about the same time the joint venture agreement is expected to be completed and have final approval from the two main shareholders. NokScoot will then begin the process of applying for an air operators’ certificate, which is expected to take approximately six months, leading to launch of services sometime in 2H2014. Nok is looking at potentially offering some of the 51% stake to other individual Thai investors. A direct investment from Thai Airways is not being considered although Thai Airways will have an indirect stake as it owns 39% of Nok. SIA will have a larger indirect stake as it owns 100% of Scoot. While much of the strategy including network and product is still being discussed, a decision has been made on the brand name and design and initial fleet. Nok CEO Patee Sarasin tells CAPA that the new carrier plans to launch with an initial fleet of two 777-200s leased from SIA. The aircraft will be retrofitted in typical Scoot configuration, which includes 370 economy class seats in a 10-abreast layout and 32 recliner style business class seats in an eight-abreast layout. There will not be any in-flight entertainment (IFE) monitors. As is the case with Scoot, the 777 will be an interim aircraft and NokScoot’s fleet will eventually transition to 787s. But Mr Patee says a decision has not yet been made on when this transition will occur and if NokScoot will take additional 777s before taking its first 787. Scoot currently operates six 777-200s, including five aircraft in its normal 402-seat configuration and a sixth aircraft which is being operated in SIA’s less dense 323-seat configuration, including 293 economy seats in a nine-abreast layout and 30 business class seats in a seven-abreast layout. As CAPA reported in Oct-2013, Scoot opted against retrofitting the sixth aircraft because it is slated to be replaced with a 787 in mid-2015. The best solution for NokScoot would have been to launch with the 787s rather than invest in 777 retrofits, which cost about SGD10 million (USD 8 million) per aircraft, and subsequently incurring fleet transition costs. But NokScoot needs to launch quickly for competitive reasons as Thai AirAsia X is already in the final stages of certification and plans to commence operations in 1Q2014. Scoot’s first 787 is slated to be delivered in 4Q2014. NokScoot will likely only launch services a couple of months prior to Scoot placing into service its first 787. But to allocate NokScoot the first batch of 787s would compromise growth for Scoot. The Singapore-based carrier’s fleet plan envisions the first as well as the second 787, which is slated for delivery in 1Q2015, being used for growth. Several additional aircraft will be delivered in the remaining three quarters of 2015, allowing for replacement of its six 777s. The growth the 787s will enable in late 2014 and early 2015 is important as Scoot has just started a one-year hiatus from expanding as it prefers to wait for 787s rather than add more interim 777s. Starting NokScoot with 777s provides more flexibility as it also opens up the possibility of having NokScoot operate some of Scoot’s 777s after Scoot starts to transition to 787s. As the group will want to avoid having both carriers operating mixed fleets, it would be logical for NokScoot to not start transitioning to 787s until after the ninth or 10th 787 is delivered to Scoot – which is likely to come in late 2015 or early 2016. But this would impact NokScoot’s profitability as the 777 is not an ideal aircraft for the low-cost model. Scoot initially settled for 777s as SIA wanted the subsidiary to quickly come to market, potentially to ward off the threat of another carrier entering the medium/long-haul LCC sector in Singapore. The 787s are a much better fit and are seen as critical for Scoot to achieve profitability. The 787-9s will provide a projected 27% reduction in per seat fuel costs compared to the 777-200s. The 787-8s will have higher per seat fuel costs as they are smaller but open up the possibility of thinner routes such as secondary cities in Japan. NokScoot will likely also discover that profitability is nearly impossible with the 777s. The 787s will significantly reduce NokScoot’s costs and give it a competitive advantage over Thai AirAsia X. The A330s operated at AirAsia are more efficient than 777s but less efficient than 787s and the AirAsia X Group is not taking new-generation A350s until 2018. As with Scoot, the 777s will allow NokScoot to launch quickly and test out its model prior to the delivery of more efficient 787s. Will NokScoot end up following Nok Air with hybrid product? While the seats and the interior will be identical, there could be some product differences between Scoot and NokScoot. Nok Air follows more of a hybrid model and offers passengers complimentary checked bags, seat assignments, snacks and water. Scoot charges economy passengers for luggage, food and drink – individually and through bundles that are sold at the time the ticket is purchased. Mr Patee believes the NokScoot product should be aligned with Nok Air. He points out that Nok’s product and service has helped build loyalty and enabled it to charge a premium compared to Thai AirAsia. Offering the same amenities on NokScoot could help the new carrier win customers, particularly in the outbound market (as Thais are much more familiar with the Nok Air product than foreigners), and provide a seamless service for passengers connecting onto domestic and short-haul international flights. But there has not yet been a final decision on the NokScoot product. The project team could ultimately decide to follow the Scoot model. This would be logical as it would lower costs and open up more ancillary opportunities. Connecting with Nok Air flights could still be managed. Scoot for example now offers short-haul connections on full-service sister carriers Singapore Airlines and SilkAir. The Scoot-Thru product, which is also available with Tigerair and between two Scoot-operated flights, offers passengers the option of paying for a transit service including through checked bags. Nok now offers a free transfer service between its flights but passengers coming off medium/long-haul flights may be more willing to pay for a transit product. Network options will also be debated over the coming months. But Mr Patee expects a focus on North Asia and says the Thailand-Japanese market particularly offers huge potential. More than 400,000 Japanese tourists visited Thailand in 1Q2013, an increase of 22% compared to 1Q2012. While Japan is a huge inbound market for Thailand, Japan’s lifting earlier this year of visa requirements for Thai nationals also has led to a surge in Thais visiting Japan. Mr Patee believes Nok is particularly well positioned for the growing outbound market as Nok has a strong local brand in Thailand, which it has successfully leveraged to become the country’s largest domestic carrier. Thai Airways now has a leading 59% share of capacity in the Thailand-Japan market. On 3-Dec-2013 Thai Airways launched services to Sendai, giving the carrier seven destinations in Japan. 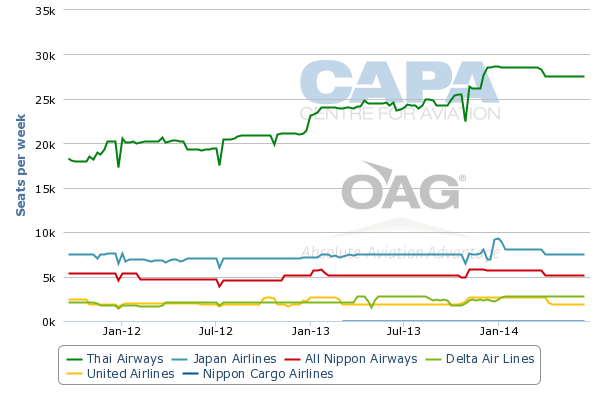 Thai Airways has grown capacity to Japan by about 35% over the past year, according to CAPA and OAG data. North Asia including Japan is also an initial target market for Thai AirAsia X. But Mr Patee sees enough demand to support multiple LCCs along with full-services carriers. He expects NokScoot to serve multiple destinations in Japan including Tokyo and Osaka. Mr Patee also sees growing outbound demand for Thailand-South Korea, which has traditionally been dominated by inbound tourists. China is another target market although remains almost entirely inbound. While Nok does not have a strong brand outside Thailand, NokScoot should be able to leverage Scoot’s brand in attracting inbound traffic from North Asia. Scoot already serves Japan as well as China, South Korea, Hong Kong and Taiwan. Mr Patee also expects NokScoot to serve Singapore, which will allow the new carrier to provide connections to its sister carrier and rotate its aircraft back to Singapore for maintenance. Scoot already operates a daily service to Bangkok but uses the main international airport, Suvarnabhumi. NokScoot would connect Bangkok Don Mueang with Singapore, a route now only served by Thai AirAsia. Nok Air currently does not serve Singapore and only has one international destination, Yangon in Myanmar. Nok over the next two years is planning to expand its regional international network, which will result in more connection options for NokScoot. Nok Air has the largest domestic network in Thailand (about 25 destinations), which NokScoot will also be able to leverage with a connection product. Nok Air’s international focus will be on destinations within Southeast Asia (excluding Singapore) and flights of less than four hours. With the exception of some potential destinations in southern China, NokScoot will have an opportunity to penetrate most of North Asia. In addition to North Asia, Thai AirAsia X is targeting Australia, which is a key market for AirAsia X from Malaysia and Scoot from Singapore. But Mr Patee does not expect Australia will be part of NokScoot’s initial network. “It’s a pretty rough market down south at the moment. Let’s focus on the key demands of what the Thai people want. At the moment North Asia is the key area we are focusing on,” he says. Australia is also an important market for Thai Airways. While Thai Airways has given Nok its support to pursue a joint venture with Scoot, the two companies are independent and NokScoot will similarly be managed independently from Thai Airways and from SIA. Ultimately there will be some impact on Thai Airways as NokScoot enters markets such as Japan. But the flag carrier recognised it was better to have its own medium/long-haul LCC to compete against Thai AirAsia X than not have one at all. NokScoot will be used to compete against AirAsia X while Thai Airways will focus on the top end of the market, similar to the model the group now uses domestically in which Nok competes against Thai AirAsia. The AirAsia brand currently accounts for about 17% of about total capacity in Thailand compared to about 36% for the Thai Airways Group (includes Thai Airways International, Thai Smile and Nok). Thai AirAsia X will allow AirAsia to start penetrating the medium/long-haul sector, a large segment which is now only served by Thai Airways and foreign carriers. But expansion at Nok and the launch of NokScoot will enable the Thai Airways Group to keep up with AirAsia and the overall growth in the Thailand market, which is also being driven by the launch of Thai Lion and Thai VietJet. Thai Lion launched on 4-Dec-2013. Thai VietJet plans to launch services in 2014. The launch of Thai VietJet, Thai AirAsia X and NokScoot will give Thailand seven low-cost carriers. With one more LCC, Thailand will match the US in having the most LCCs of any country. Thailand is also currently served by nearly 20 foreign LCCs. There are already over 600,000 weekly LCC seats to, from and within Thailand. 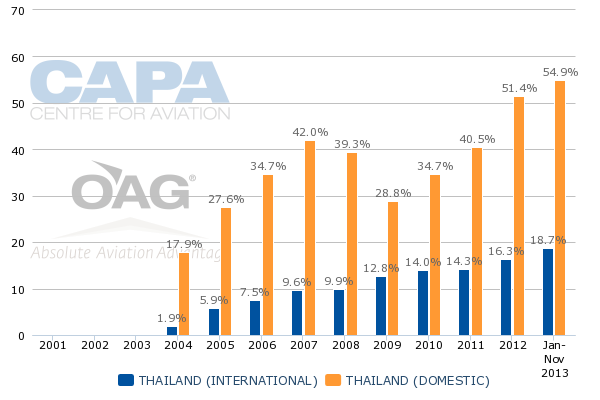 LCCs currently account for almost 60% of Thailand’s domestic market and about 19% of Thailand’s international market. 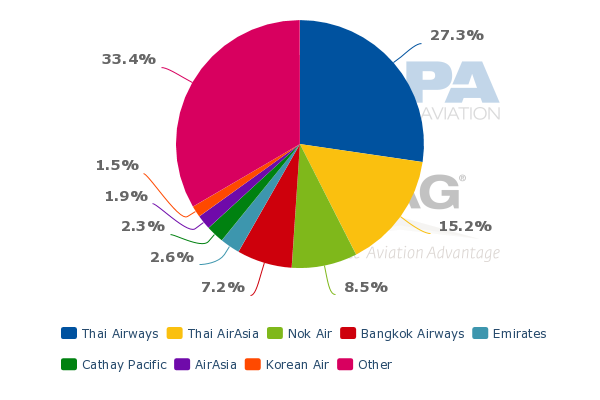 Thailand's international LCC penetration rate, which is much lower than the international LCC penetration rate in Singapore or Malaysia, will increase significantly as Thai AirAsia X and NokScoot start to penetrate the medium/long-haul sector. As CAPA reported in Oct-2013, Thailand is a logical second market for Malaysia-based AirAsia X as the AirAsia brand already has a strong local presence through Thai AirAsia. Strong leisure demand also makes Thailand a natural market for medium/long-haul LCCs. Thai AirAsia X will initially operate a fleet of two A330-300s configured with 365 economy and 12 flat bed seats. For Scoot, Thailand is a logical new market as the carrier looks to expand outside its initial home market of Singapore. Scoot already serves Thailand and competes with AirAsia X in some connecting markets such as Thailand-Australia. Partnering with a like-minded LCC in Nok Air should be a win-win proposition as both airlines can learn from each other’s experiences and take the best of both in deciding on a model for NokScoot.